Fast forward two years later. The twin tip wakeboard was giving riders an entirely new perspective and wakeboarders started experimenting more with extended pylons, weighting, and double ups. Hit It! signified the beginning of wakeboarding’s golden era and solidified Scott’s role as “the godfather“. Yeah, Darin Shapiro could huck two flips around, but he didn’t have that charismatic dissenting style. I’m often asked by skateboarder’s “what makes Byerly a legend?” I often answer their question with another question,”What makes Lance Mountain a legend?” They usually get it after that. 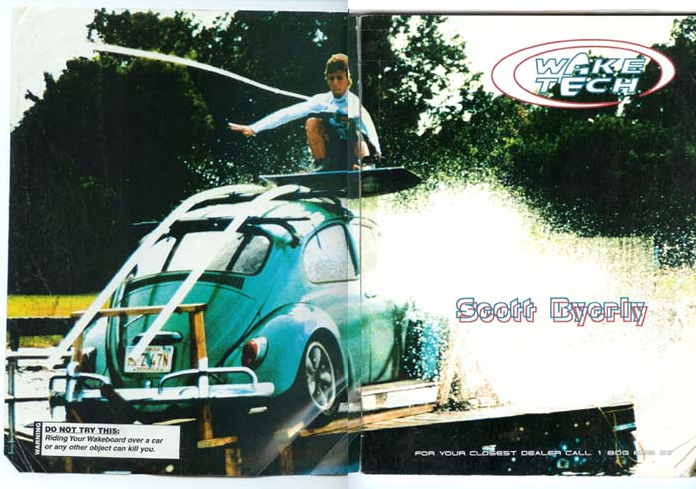 Now Scott runs his own sub-brand under industry giant, Hyperlite Wake MFG., and is the ringleader of a group of young vagabonds known as team byerly. Guys like Aaron Rathy and Brenton Priestly keep his tradition alive and continue to push the sport in directions that the proverbial wake jock will never be able to understand. That, my friends, is legacy at its finest.